Designer Costume Jewelry is not only a beautiful jewelry investment but the sustainable jewelry alternative to brand spank'n new, fresh out of the box manufactured jewelry. This genre of jewelry has been the preference of Queens, princesses and famous Hollywood actresses for centuries and for good reason. What jewelry today can compare to the boldness of 1940s Designer Costume designs that originated from the major New York and Paris luxury houses, the undisputed leaders in the world of Antique costume jewelry? Costume Jewelry if chosen with skill and experience can fetch outrageously high prices in today's marketplace. Have your Costume Jewelry valued within 48 hours by Costume Jewelry experts who understand and appreciate this highly profitable market. Designer Costume can be found amongst the finest and most famous jewelry collections in the world. It often resides under glass, in the most exclusive high-end jewelry stores. Designer Costume Jewelry is anything but Costume. Designer costume jewelry is often made on special order under a renowned Jewelry brand. You can describe a piece of Jewelry as "designer" simply from the designer's logo inscribed on it or you can Identify Costume Jewelry by the designer's signature trademarks and design preferences. French designers and couturiers understood the allure women found in discovering a designer brand or a personal style that felt stylish yet more affordable than fine premier antique jewelry. The French opened the door to Designer Costume Jewelry on the continent however the Americans produced more pieces. In the 1940s, principal costume jewelry designer belonged to the major glamorous New York and Paris Jewel houses. Among the breathtaking jewels in the exhibition was a pair of Boucheron aquamarine and diamond clip-brooches given to Princess Elizabeth by her father, King George VI, for her 18th birthday. Other personal gifts include a gold, sapphire, diamond and ruby bracelet made by Boucheron to Prince Philip’s design. It was given to The Queen on their fifth wedding anniversary and incorporates the interlaced initials ‘E’ and ‘P’. A dazzling flower brooch by Cartier was also on display. Set with the 23.6-carats of pink diamonds and baguette diamonds, it was given to The Queen by Dr Williamson. The American forms like Traebert and Hoeffer, Marcus and co, John Rubel as well as individual jewelry designers like Paul Flato, and the New York branches of Paris jewel houses all turned out very glamorous creations. Mauboussin, founded in 1827 was known for his lavish and adventurous use of precious stones. In the 1930s, Mauboussin joined up with Traebert and Hoeffer and together produced some of the most dramatic jewels of the period. You will find these pieces stamped with the trade name 'Reflection'. The Parisian firm of Rene Boivin, flourished in the 1930s, making a transition to softer curving draped designs with good use of sweeping gold work. Tiger jewels, was one of Boivin's specialties, particular bracelets in the form of stretching tigers. Van Clef & Arpels, founded in 1906, and the descendants of generations of jewelers were notable in the 1940s for their avant-garde designs. Van Clef & Arpels were particularly famous for their invisibly set jewels and the use of star setting for small stones and later in the same decade for their famous 'tulle' jewels. Famous actresses and fashion icons, can't get enough of Designer Costume Jewelry. At the Guild Hall’s Summer Gala Celebrating Larry Rivers’ Early Works at Mulford Farms East Hampton, NY on Friday August 8, 2008, high society gals, Kelly Briter and Allison Mcatte were wearing, Designer Costume Jewelry by Van Clef & Arpels. With boutiques on Madison Avenue and in the Bellagio Hotel in Las Vegas, Fred Leighton offers one of the broadest selections of stylish designer vintage jewelry in the U.S. 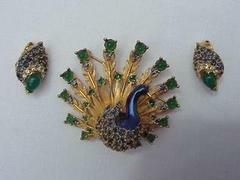 Among his stock are rarified signed Cartier Art Deco pieces and more approachable 1950’s Bulgari. Bulgari, the jewelry designer of Italy led a band of jewelers working in this glamorous cocktail style. And talking about frothy 'tuille jewels and gowns' look at Eva Longoria Parker, (May 2008- Cannes Red Carpet) wearing a white gown and train and Van Clef & Arpels jewels. She is old-Hollywood glamorous, 20th century cocktail at its best, in a frothy tulle white Versace Atelier gown. Sterle, a Paris Jeweler worked with the couturier Jacques Fath in the 1950s and made costume designer jewelry in the form of diamond rose petals, arrows and feathers, wings and bows with a huge display of gemstones either all diamonds or colored semi-precious stones in fantasy themes. Sterle's work had the fashion design flair and the use of color and form and he created jewels in the spirit of the cocktail age. Major costume jewelry designers included the American firm Trifari, the American designer Marcel Boucher. In France, the big three were Elsa Schiaparelli , Christian Dior and Chanel Costume Jewelry. Coco Chanel successfully wrote Chanel Costume Jewelry into her own fashion philosophy. In Switzerland, major watch companies produced elegant and stylish cocktail wristwatches. The ultimate in luxury watches , the cocktail wristwatches or 'montres bracelets' were extremely popular and worn on the wrist of fashionable ladies at the new cocktail hour. Often they have a flexible gold band and were set with a huge central gem set surrounding the watch face. Square cut rubies and sapphires were used or the little gems set in star settings. These innovative luxury watches were made in Switzerland, by leading watch manufacturers, Rolex, Baume-Mercier, Piaget, Patek Philippe, and Gubelin of Lucerne. Fulco Santostefano della Cerda, Duke of Verdura, of Sicily worked with Chanel in the 1930s. In the 40s and 50s his jewels of gold and semi-precious stones were famous. Even off screen, Hollywood's stars, and jewelry aficionados, have long revered Verdura as a figure holding a special place in the rarefied world of bespoke jewelry, a reference for both opulence and creative individuality. For most of its 70 years, the firm have operated almost as a private club, from its plush New York showroom, 12 floors above Fifth Avenue near 57th Street. Until quite recently an appointment was required. Joan Crawford and Marlene Dietrich were both Verdura devotees, and a curb-link bracelet watch that he made for Greta Garbo was one of her lifelong treasures. The firm still continues today (E J. Landrigan/Vendura) and attracts exclusive clientele looking for something very different and combined with fine workmanship. Vendura's use of gold and colored stones had a huge influence on modern jewelry designs today. Jewelry designer, Vendura had a strong sense of romance, fashion and fantasy and instinctively seemed to know what made women look good. Elegant yet luxurious the jewels he created glowed with light. The famous wide bangles that Chanel wore on each wrist, of black and white enamel and set with a Maltese crosses were designed by Fulco Santostefano Della Cerda, Duke of Vendura. Designer Costume Jewelry, like the jewels produced by Verdura, still live on and now the families of Verdura's original devoted clients still continue to buy Verdura's originals or those made in his style and spirit. Designer Costume Jewelry and Antique Jewelry are investment worthy assets that you can wear and enjoy. They are anything but "Costume" and anything but "Antique". Cartier's "GREAT CATS" were first commissioned by the Duke of Windsor for the love of Wallis Simpson. The Big Cat was a profoundly significant symbol, for the King of England who abdicated the throne, for the love of Wallis Simpson. What is of particular interest in relation to the Wallace Simpson story in the History of Jewels is the extraordinary fact, that the Leopard head symbol, has been the LONDON town mark for precious metals, since 1478! A fitting symbol for a King of England, one would think? It is believed however, to have been Verdura's idea, to create the first of the six spectacular Big Cat jewels from CARTIER. Since the late 19th century, the big cat jewelry has been a world-wide emblem for the femme-fatale.